Ukiyo-e had gone into a decline and it looked like it wasn't going to come back out. Watanabe Shozaburo single-handedly turned things around with the creation of a new school of woodblock printing called "shin-hanga" (new printing). Shin-hanga used the western principles of lighting and shading along with a wider variety of subjects, to create an art form that looked closer to painting. At the same time, he focused on selling his prints to the European, British and American markets. From this point on, hanga effectively disappears from the Japanese markets, and shin-hanga prints don't make their way back to Japan until various western collectors donate their collections to Japanese galleries or museums. Shin-hanga continues as an art form until 1942. It's main contribution to our manga history is that a number of later illustrators continue to be trained in hanga and shin-hanga techniques before becoming manga artists. Ito Shinsui's "Before the Mirror", an example of shin-hanga. From the wiki entry, used for review purposes only. Books are still being produced, but there's little to discuss regarding them right now. The primary drawback is that they're too expensive for the masses to buy outright in bulk, and while there are still some children's books coming out on the market, most books are aimed at educated males. Shonen Club, from Birth of a Million Seller, used for review purposes only. Kodansha Club, from Birth of a Million Seller, used for review purposes only. Shojo Gaho, from Birth of a Million Seller, used for review purposes only. Kodomo Tomo, from the Saitama Manga Museum, used for review purposes only. Newspapers go back into a kind of stasis. All the real activity for manga is in the magazines. Newspapers continue to run ponchi-e, editorial cartoons, and drawn pictures to illustrate current events. 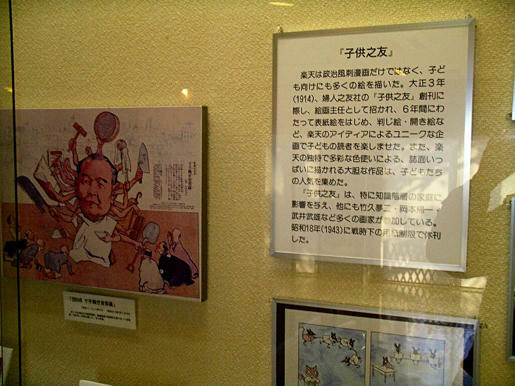 All real growth of caricature "manga" can be said to be instigated by Ippei Okamoto and any followers he gathers. That being said, major cities all around Japan pretty much now have at least one paper to call their own, printing local news and events, along with national and global news and editorial "manga".